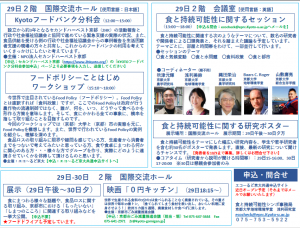 This is the first conference which will cover wide range of concept on “food and sustainability”. 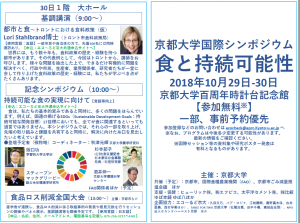 Keynote lecture, special symposium, oral and poster sessions and networking events will be held by Kyoto University Graduate School or Agriculture, Graduate School of Global Environmental Studies and other faculties and organizations. 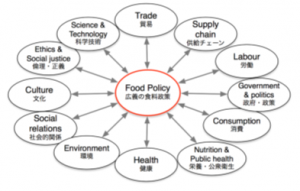 ◆ Themes: Appropriate are themes surrounding food and its sustainability. We especially welcome multi-themed projects, as well as researchers looking to connect to a broad theme hereafter. ◆ Overview for abstract submissions: Please send a Word file including the title, an up to 200 word abstract, and the author’s name, department, and title (file name should be the head author’s name). ※ Attendees from abroad are charged the price for advanced bank transfers even if paying at the event.